So, it's a very PINK Christmas for this one. Shocking for me to use pink, right? :) That pink plaid paper is from the Letters to Santa DSP...which technically IS a Christmas paper pack. Hooray for non-traditional colors! 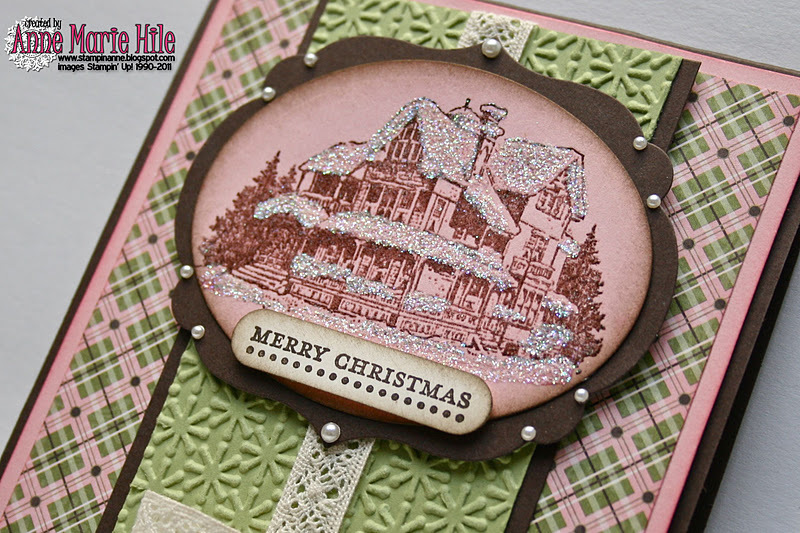 I embossed the image form the Christmas Lodge stamp set and added some "snowy" accents with Dazzling Diamonds glitter. I sponged the edges with Early Espresso ink. It's also my first time breaking in the new Labels Collection Framelits (from the Occasions Mini catalog) for the frame around the image. Thanks for stopping by. 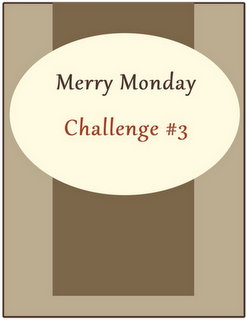 If you get a chance, check out Lesley's Merry Monday challenge. It's a lot of fun! Have a great day! This is so pretty, love the colors and the texture. Good luck with the making the cards not sure I could do that :) This is a great start, it really is beautiful. Holy smokes AM...you have taken my simple sketch and created a masterpiece. I love the colours! The ribbon and the "everything" is amazing. Yeowza! Stunning! I love non-traditional colors. So beautiful ... especially in PINK! Another gorgeous card! LOVE that DP you used on here. So pretty! Your non-traditional colors are fantastic! This is one superb card. I really like the color combo, the image and all the details. I agree with Lesley, you've taken a simple sketch and created a beauty! Ooh, la la! Anne Marie - this is just gorgeous! I love the colors and the snow on the house is just the perfect touch. And leave it to you to make the new Framelits a must have now! Anne this is gorgeous! and I love the idea of a Merry Monday challenge. I will have to pop on over and check your friend out. Lovely job. I like the non-traditional colors! The snow on the roof is awesome!! I think this is very pretty in pink! Oh. My. Gosh! I LOOOOOVE this pretty card, Anne Marie! great glittered roof, and the plaid and pink are PERFECT! Big hugs!! 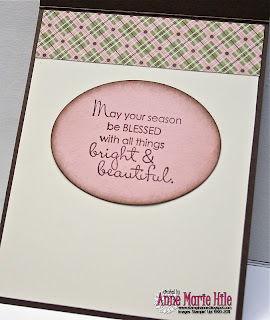 You pulled off a pretty pink Christmas card! Wowza, Anne Marie, this is gorgeous! Love the sparkling snow covered roof! Have a great weekend!